Bookies or the Punters.. Who Won? Day One was all about Champions Day, and it was certainly the bookies lighting the torch after four Grade One's which included an unlikely winner in the Champion Hurdle. A Plus Tard was the only winning favourite from the seven races on the card, who landed the Close Brothers Handicap Chase for Henry De Bromhead, and a first Festival winner for Rachael Blackmore, on a day where punters notably struggled. You could argue the day got off to a flyer, when Ruby Walsh and Willie Mullins took the opener with the well backed Klassical Dream. The Arkle looked a tough puzzle beforehand and was made easier when Glen Forsa unseated at the third, but still Duc Des Genievres - one of a number in with a claim beforehand, won at odds of 6/1. The feature race was the story of the day however, and the bookmakers could have not fared better, with Buveur D'Air falling halfway round, Apple's Jade never a factor and Laurina missing out on a place in the final strides. Espoir D'Allen - a 16/1 victor, collected the £450,000 prize. It only got better for them when the shortest price favourite of the day failed to win, after Benie Des Dieux fell at the last under Ruby Walsh in the colours of Susannah Ricci in the Mares Hurdle, bringing back memories of his fall at the same flight on Annie Power three years ago in the same contest. Day One belonged to the bookies alright. The punters were not going to give up that easy alright, and were certainly back in the frame after four favourites won successively on Day Two of the Cheltenham Festival - Ladies Day. Aside from William Henry's victory in the Coral Cup for Nico De Boinville, no horse won at odds bigger than 8/1 on Day Two - the biggest of which was City Island's triumph in the Ballymore which could you not suggest was fortuitous. Topofthegame led home the two other market principles in the RSA, before as mentioned, four favourites landed the spoils in a row, which was made six on the spin after the opening two races on Thursday. The big double of the day landed for the punters, with Altior fighting back to regain his Champion Chase crown to continue his unbeaten record, half an hour before Tiger Roll ran away with another Cross Country Chase - both he and Altior making it four Festival wins each and showing no signs of stopping. Band Of Outlaws provided a first Festival winner for Joseph O'Brien in the Fred Winter, before Envoi Allen proved his Irish form was no fluke when taking the Champion Bumper ahead of market rival Blue Sari. The pendulum had swung the punters way, who had the initiative going into Day Three. Day Three was all about whether any of the Irish contingent could spoil the Andrew Gemmell story with Paisley Park in the Stayers Hurdle. The bookies named this horse as the 'individual worth the biggest payout' before the Festival, and their nightmares were made to come true, as the 7yo - who looked to be in a spot of trouble down the side of the course, surged up the run-in to draw away from the field under Aidan Coleman. Paisley Park was the third favourite from the first four races to land, after Defi Du Seuil and Barry Geraghty took the JLT Novices Chase, before McManus' first rider somehow managed to get Sire Du Berlais home in front in the Pertemps. Both Footpad and Road To Respect proved no match to Frodon in the Ryanair, before the first two in the market fought out the finish in the Brown Advisory Plate - Siruh Du Lac, another winning female rider, fending off the challenge of Janika. The day did end on a sour note for the punters, when Epatante found little for pressure when well fancied for the Mares Novice - a race won by Noel Fehily onboard the Willie Mullins trained Eglantine Du Seuil, at odds of 50/1. 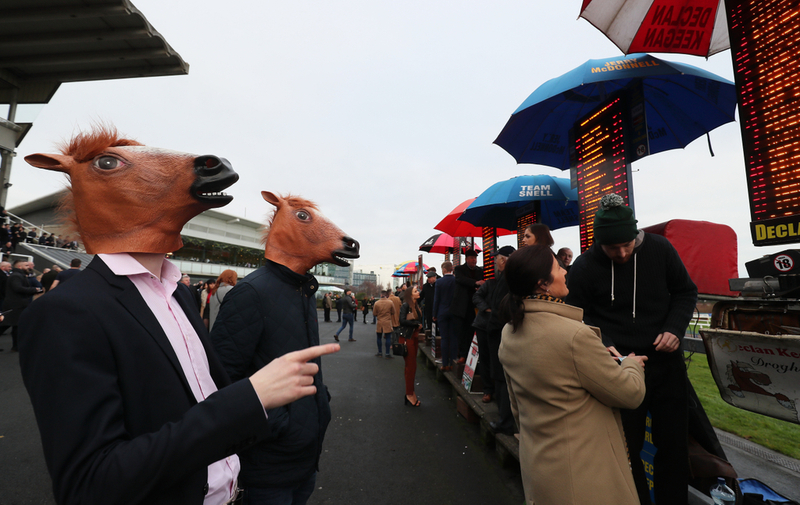 The bookmakers continued the trend on Day Four and Gold Cup day, as it appeared almost impossible for punters to find a winner, in a day packed with large-odds winners. The day got off to the worst possible start for the sport, letalone the punters, when Sir Erec was pulled up fatally injured - one of two fatalities on the final day. A real shame for a gorgeous 4yo, who had so much more to give in his career. Pentland Hills was left to land the spoils for the largest syndicate of owners at the Festival. The Albert Bartlett - always tricky to find the winner, was won by Minella Indo at odds of 50/1, equalling the biggest price winner of the week, until Kielan Woods prevailed for trainer Ben Case in the Grand Annual, aboard 66/1 shot Croco Bay who rolled back the years as a 12yo. Al Boum Photo took the Gold Cup at a 12/1 price, after the market principles Presenting Percy, Clan Des Obeaux and Native River failed to finish in the placings. The bookmakers finished with a flourish when Magic Saint and the well-backed Dallas Des Pictons failed to justify favouritism in the final two contests of the meeting. Honours even in the end, and a 2-2 draw it would seem, but well done if you landed one of the big priced ones.